Xiaomi on Tuesday fired another shot in the shrinking bezel wars, as it announced a smartphone with a front that's more than 90 percent display. The Mi Mix is a 6.4-inch phone that's stylishly crafted by French designer Philippe Starck. It sports a feature set that indicates Xiaomi wants to compete at the high end of the smartphone market. "For many years, Xiaomi has had a reputation of copying designs and branding from Apple and Samsung," said Ross Rubin, principal analyst at Reticle Research. "This phone breaks with those designs," he told TechNewsWorld. "One factor for success is trying to get the greatest possible screen area into the smallest possible footprint," Rubin said. "This design comes close to the ideal of an all-screen phone." The Mi Mix has a screen-to-body ratio of 91.3 percent. That compares to 67.7 percent for Apple's iPhone 7 Plus. To expand the Mi Mix's display, Xiaomi grabbed the real estate at the top of the phone occupied by the front-facing camera, ear speaker and proximity sensor. It did that by moving the front-facing camera to the bottom of the phone, and replacing the ear speaker with a piezoelectric speaker that uses the metal frame of the phone to generate sound. It also replaced the infrared proximity sensor found on most phones with one that uses sound. The proximity sensor turns off a smartphone's display as the device approaches the ear. Most phones use an infrared sensor at the top of the phone to do that. The Mi Mix uses ultrasound waves and software to do it. "We use the sound transmitter that's already inside the phone," explained Guenael Strutt, vice president of product development at Elliptic Labs, maker of the ultrasound technology, which it calls "Inner Beauty." "The sonic wave echos off the head, is picked up by a microphone, and the data is processed by our algorithms inside the phone," he told TechNewsWorld. "We use components in the phone to detect the head -- we don't have to add a new sensor." Using sound to detect proximity also avoids issues that make infrared sensors unreliable from time to time, such as weather conditions or skin and hair coloring. 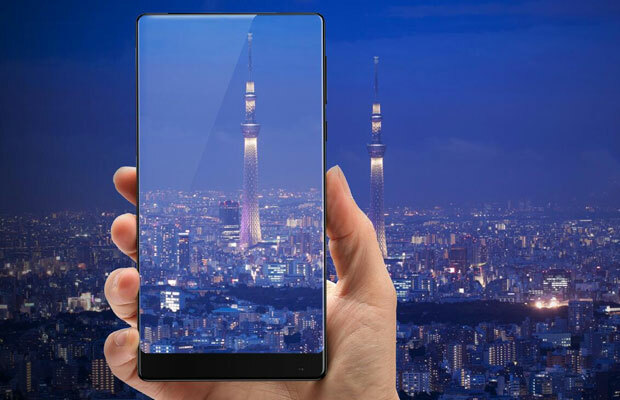 In addition to its eye-catching display, the Mi Mix has a 16-megapixel camera with phase-detect auto focusing, a generous 4,400 mAh battery, two SIM slots and a Snapdragon 821 processor. It supports high-definition audio with a 192 Hz/24-bit DAC chip, which users can listen to through a standard headphone jack. Although the Mi Mix is officially a concept phone, Xiaomi will start selling it in China next week. Models with 4 GB of RAM and 128 GB of storage will be priced at US$516, and those with 6 GB of RAM and 256 GB of storage will sell for $590. "Xiami lost a lot of traction in China as Vivo and Oppo strengthened their position in the lower end, and Huawei and Apple took the high end," said Carolina Milanesi, a principal analyst at Creative Strategies. "I see the new Mi Mix concept phone as an attempt by Xiaomi to recapture the higher end of the market and reposition itself as an innovator," she told TechNewsWorld. Xiaomi already is a top global contender because of its performance in China, and it wants to challenge Huawei in the West as best-performing Chinese brand. It's unlikely the Mi Mix will be made for the mass market, though, in Milanesi's view. "Chinese consumers love large screens, and the quality of the display looks fantastic," she said, and "$520 is in line with their pricing strategy of delivering a high-end experience at an affordable price." That said, "it will be interesting to see what supplies will be, as I have a feeling that these phones are more focused on revamping brand than growing sales," Milanesi added. Xiaomi might be wise to sell as many Mi Mixes as the market will bear as fast as it can before competition heats up. More designs like the Mi Mix will start appearing in the next 12 months, said Daniel Matte, an analyst at Canalys.